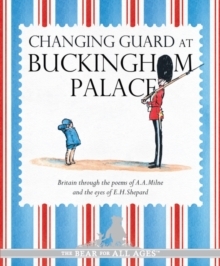 They’re changing guard at Buckingham Palace – Christopher Robin went down with Alice. Alice is marrying one of the guard. “A soldier’s life is terrible hard,” Says Alice. From A. A. Milne, author of Winnie-the-Pooh, this poetry collection is steeped in the history and culture of the British Isles – and generations of British children have grown up with them. Now collected together in a beautiful gift edition, with exquisite artwork from Winnie-the-Pooh illustrator E. H. Shepard, this is the perfect memento of a trip to London – or a wonderful gift for a christening or special birthday. Suitable for children of 5 and 55. Look out for Milne’s other poetry collections featuring Pooh: When We Were Very Young Now We Are Six The nation’s favourite teddy bear has been delighting generations of children for 90 years. Milne’s classic children’s stories – featuring Tigger, Piglet, Eeyore, Christopher Robin and, of course, Pooh himself – are both heart-warming and funny, teaching lessons of friendship and reflecting the power of a child’s imagination like no other story before or since. Pooh ranks alongside other beloved character such as Paddington Bear, and Peter Rabbit as an essential part of our literary heritage. A.A. Milne is quite simply one of the most famous children’s authors of all time. He created Winnie-the-Pooh and his friends Piglet, Eeyore, Tigger, Kanga and Roo based on the real nursery toys played with by his son, Christopher Robin. And those characters not only became the stars of his classic children’s books, Winnie-the-Pooh and The House at Pooh Corner, and his poetry for children, they have also been adapted for film, TV and the stage. Through his writings for Punch magazine, A.A.
Milne met E.H. Shepard. Shepard went on to draw the original illustrations to accompany Milne’s classics, earning him the name “the man who drew Pooh”.